These cat pins feature a cat climbing on a capital letter. 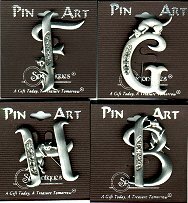 These pins are made of pewter so they never need polishing. The rhinestones add a decorative touch. Supplier has discontinued the design so only the following initials are available in the quantity indicated: F(2),J(1),T(1),W(2).